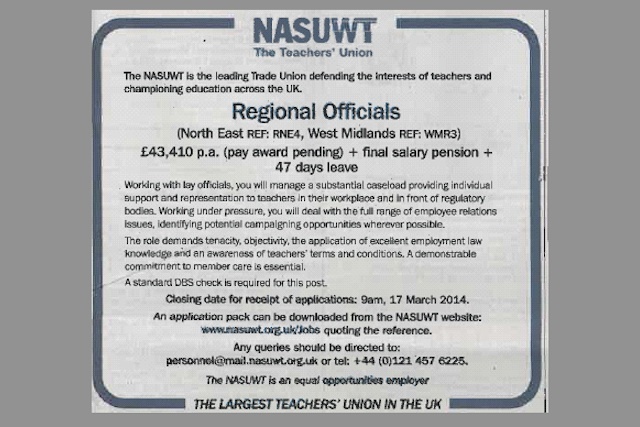 A recruitment ad placed by the teaching union the NASUWT has been banned for claiming it was "the largest teachers' union in the UK" after a complaint was made by rival union the NUT. The dispute over the ad descended into a schoolyard brawl. The NASUWT claimed to have Geography on its side, taking in members in both Scotland and Northern Ireland, while NUT does not. NASUWT went on to claim it also had Maths on its side, saying it represented a greater number of practising teachers, with 240,226 balloted members against 218,370 for NUT. But the final decision came down to English. NASUWT did not claim to be the largest union of practising teachers, but the largest union. NUT had more members who were not practicing teachers – students and retirees, and a complicated relationship with the Trades Union Congress, which adds additional members. Unfortunately for NASUWT, they failed to account for themselves and their claim to be the "largest teachers’ union", and the ASA upheld the complaint. In its assessment, the ASA said, "without qualification, consumers would understand the claim 'The largest teachers' union in the UK' to mean that the NASUWT, as a teacher's union, had the highest number of members in the UK compared with any other UK teachers' union." In its examination of the voting habits and affiliations of the different unions, ASA concluded that NASUWT failed to read the question properly, and submitted evidence for the number of practicing teachers, when what was wanted was evidence of absolute numbers. A schoolboy error. In summing up, the ASA concluded: "The submitted evidence did not demonstrate an accurate comparison of practising teachers in each union, because evidence was not submitted to demonstrate that the NASUWT had more members than the NUT, we considered that this claim had not been substantiated and concluded that the ad was misleading." The ad breached CAP Code (Edition 12) rules 3.1, 3.3 (Misleading advertising), 3.7 (Substantiation) and 3.33 (Comparisons with identifiable competitors) and must not run again, and must write 100 times, "I must substantiate claims in future ads".